Kasama ware can be traced back to the An’ei years (1772-1781) of the Edo Period (1603-1868). It’s said to have originated when Hanemon Hisano, the head of the town of Hakoda (now a region of Kasama City), invited ceramist Choemon from the town of Shigaraki in Omi Province (today’s Shiga Prefecture) to build a kiln. Later, Kasama’s feudal lord, Makino Sadaharu, implemented a policy of pottery advancement, resulting in increased production of daily goods such as pots and mortars using Kasama ware. 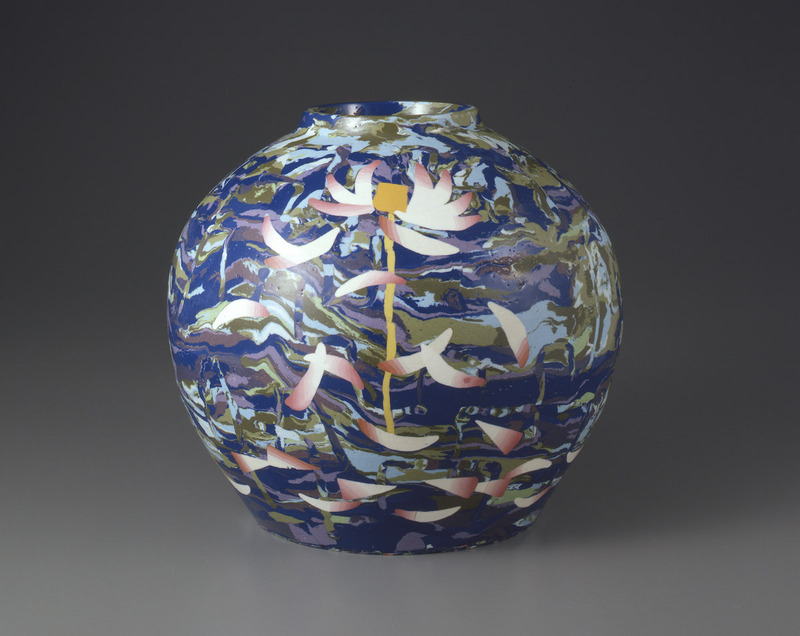 Kosei Matsui, a designated living national treasure, fused traditional techniques with his own creative expression to craft beautiful ceramics. This exhibition showcases some of the finest examples of Matsui’s works. 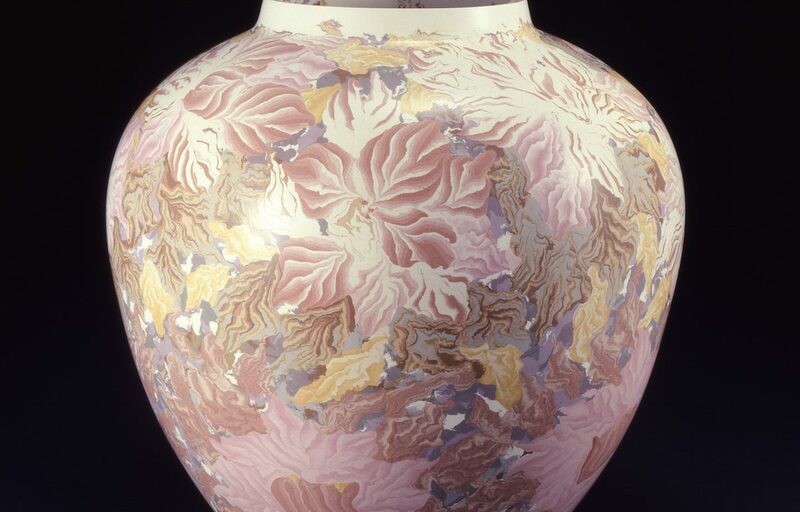 Matsui was a master of the traditional ceramic technique called neriage, which uses two types of clay to create delicate marbled patterns on the surface of the ware. At this exhibition, organized by The Nippon Club in conjunction with Ibaraki Prefecture, fragments of pottery by Kosei Matsui will be exhibited, allowing guests to see a different view of his works and feel them directly in their hands. These fragments, which are exhibited at the Ibaraki Prefectural Ceramic Art of Museum, are the remains of a damaged pottery in Matsui’s studio during the Great East Japan Earthquake of March 11, 2011. In addition, the works by three of the most up-and-coming modern ceramic artists, Hiroyuki Onuki, Koji Toda, Akio Nukaga, will be exhibited. Their guinomi (sake cups) and sake bottles, made as part of the Sake and Pottery Project between Kasama ware and a sake brewery in Ibaraki Prefecture, will be on display. Through this project, the pottery artists taste sake and then make special guinomi in the image of how the artists depict the taste of sake to look. The Nippon Club will introduce the project through videos as well. The guest curator of this exhibition is Mie Tsunobe. JCC Fund (Japanese Chamber of Commerce & Industry of New York, Inc.), Sekisho Co., Ltd., and SECOM Co., Ltd. are sponsors of this exhibition, which is supported by the Consulate General of Japan in New York; The Japan Foundation, New York; the Ibaraki Art Ceramic Museum; and Kasama City, Ibaraki, Japan. For more information, please visit The Nippon Club’s website.